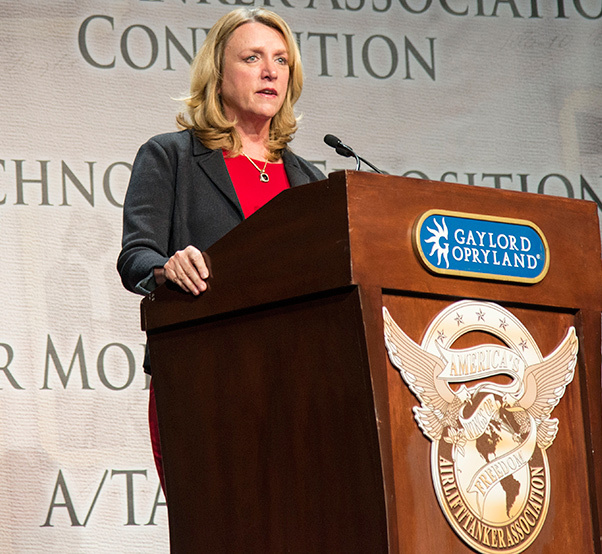 Air Force Secretary Deborah Lee James discusses modernization and how mobility Airmen enable the fight during the 48th Annual Airlift Tanker Association Convention in Nashville, Tenn., Oct. 28, 2015. The symposium served as a key professional development forum for Mobility Air Forces Airmen by enabling direct access to senior mobility leaders and fostering an environment encouraging open dialogue and honest discussions. 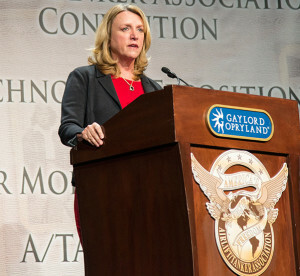 With increasing global threats, James reiterated her emphasis on the Air Force maintaining its global readiness. Air Mobility Command, assigned with enabling rapid aerial transportation missions, has been in the forefront of mobility efforts to support the current fight in Mosul, Iraq. AMC professionals and capabilities enabled delivery of critical supplies, equipment, and ensured repairs of an airfield called Q-West, near Mosul. Additionally, they also supplied ground forces in northern Iraq via a robust airdrop capability. Supporting combat and humanitarian missions abroad remains a primary focus, not only for AMC, but for the Air Force as a whole. These efforts can only be continued through modernizing our fleet to make sure we maintain air dominance.